So you’ve written your book, you’ve formatted everything, and have a snazzy cover image. All you have to do now is slap the title on your image and you’re good to go, right? Well, yes…if you want a quickie cover. But if you take some time, you can make it a lot more appealing. I got some ideas from J.M. Grimm, who has a Cover Design Primer on her blog; check it out, it’s invaluable information. I created a small canvas, 500X275 pixels. 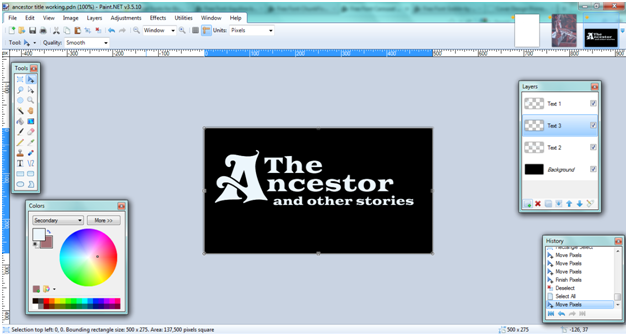 The size doesn’t really matter, but keeping it small meant I had to fit all my text in that area–an area I knew would fit on the canvas for the cover image, which is 600X800. Next, I added several layers and labelled them. I made the background layer black so my text (which is going to be a light color) showed up well; later we’ll be deleting that layer. I have three layers for text. Select your font. Be careful where you get your fonts–many of them are licensed, and will cost you. I went to Font Squirrel, which has tons of fonts for free. 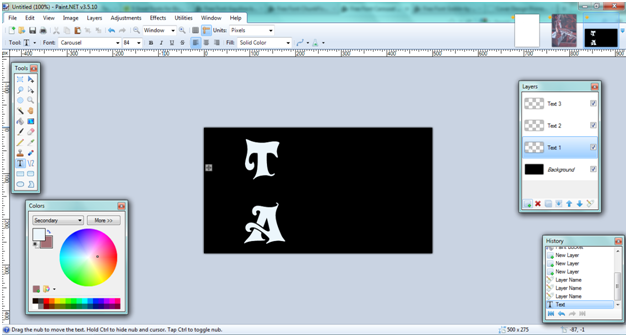 Get two fonts, as it will create some tension and contrast in your cover. I decided to use one font (Carousel) for the capital letters, and another (Goblin) for the rest of the text. See J.M. Grimm’s advice on her blog; she talks a lot about the different kinds of typefaces, and some basic design advice as to which works with which. Very important information. The capital letters went on one layer, and the rest of the text on a separate one. This enables me to move the capitals separately from the rest, so I can position them easily. Otherwise you risk clipping one or the other as you draw select boxes and move stuff around. Make your life easier, and use separate layers. I just put the title and subtitle in the middle there, but you can draw a select box and move it wherever you want. Build your arrangement–again, J.M. Grimm has some good advice. You want it to look dynamic; it’s all well and good to have your title all on one line, but switching it up can make it look more interesting. It depends on the “vibe” you want to give with your cover, and it’ll be different for every book. Play around until you find something you like. I changed the font of The to all Goblin. I think it looks better, and draws more attention to the A. When you’re satisfied, save it under a separate file name–say, titleworking–which will let you go back to the original if you decide you don’t like it. 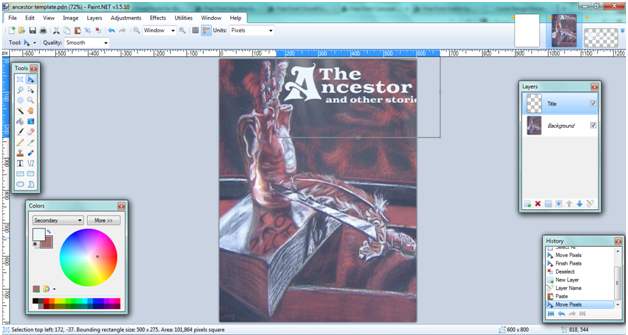 Finally, go to your title block and merge all your layers except the background (if you keep the background, you’ll end up with a black rectangle on your cover). Use Ctrl+A and Ctrl+C to copy. Then open up your cover image and create a second layer called “Text;” again, this allows you to move it independently of the background image. Move it to where you want it to be to make sure it fits, and that you like the composition. As you can see, my subtitle doesn’t fit–I had to go back and change that. That’s step one. This post is getting longer than anticipated, so I’m going to split it–watch for step two tomorrow, where we’ll talk about making some nice effects for your title. 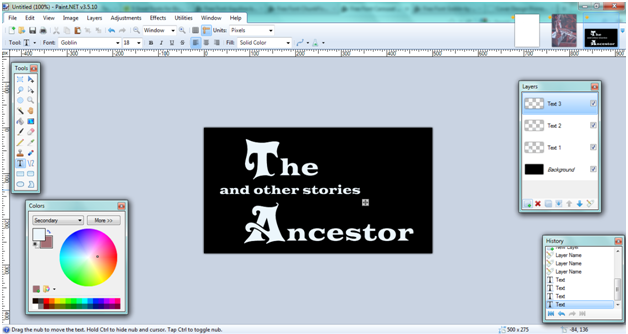 In the meantime, I’m pleased to announce that The Ancestor and Other Stories is formatted and ready for release! If you’re on our Community List, you’ll receive a free copy soon. If you haven’t signed up, do so here before 12:00 Mountain Time and I’ll send you a copy too. You’ll save a couple bucks. If you have any tips or tricks with graphic design, let us know in the comments. See you tomorrow!